Agri Seedco will increase smallholder farmers’ resilience by introducing two drought-resistant varieties of sorghum seed to the Kenyan market. Sorghum is currently in high demand because of a government program providing financial incentives to procure the crop in-country, and because breweries are looking to replace barley with sorghum for beer production. With support from Feed the Future Partnering for Innovation, Agri Seedco will commercialize its new sorghum seed varieties with the objective of diversifying the livelihoods of maize farmers who are struggling to respond to climate shocks and pests like Fall Armyworm and Striga. 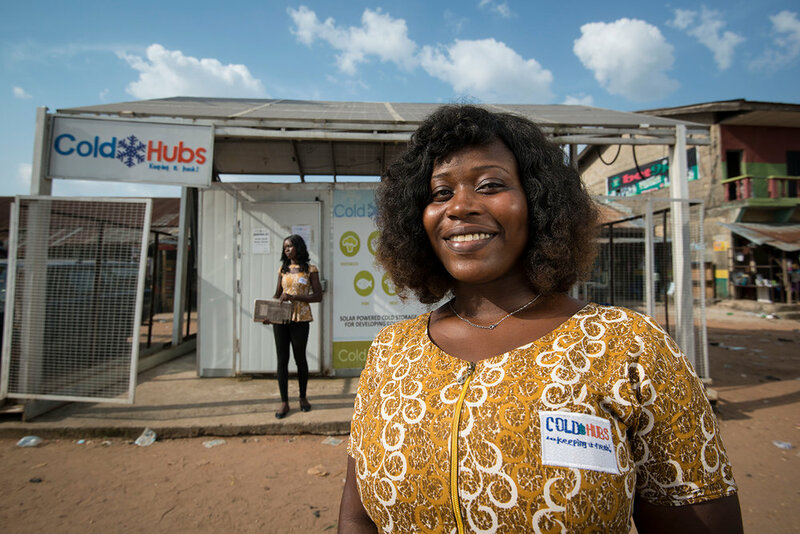 ColdHubs will reduce postharvest loss and increase smallholder farmer income by introducing cold storage rooms near markets and farms in Nigeria. Ten new hubs with 20 new cold rooms will be established on a pay-as-you-go system that lets farmers store perishable produce as they wait for market prices to increase. Each cold room is 100 percent solar powered and administered by a full-time hub manager, typically a woman in the community, who also plays a key role in continued education of farmers, traders, and retailers about the importance of cold storage. Hester will help fight a common livestock disease, Peste des Petits Ruminants (PPR), by introducing a thermostable vaccine in Nepal. This new formula does not require refrigeration to be transported, eliminating the need for a cold chain and making smallholder farmers in remote areas more resilient by providing access to the vaccine for the first time. This will improve the animal health of existing herds and encourage smallholder farmers not currently involved in livestock rearing to consider it as an alternative to crop production in response to changing climate conditions. With support from Feed the Future Partnering for Innovation, Hester will produce and distribute the thermostable PPR vaccine and raise awareness of the dangers of PPR among smallholder farmers though a network of community health workers. Smallholder coffee producers are especially vulnerable to climate shocks and fluctuating coffee prices because they lack access to finance and depend on unreliable income sources. With support from Feed the Future Partnering for Innovation, Neumann Gruppe will help farmers access finance and increase production by advancing inputs and taking on the long-term investment of renovating trees with drought-resilient varieties. Working with cooperatives in Kenya and Honduras, Neumann Gruppe will solidify its position as a steady buyer of high-quality coffee, giving producers a reliable market and source of income. Takaful will sell index-based livestock insurance to support the resilience of pastoralists in Kenya who are facing increased herd loss from droughts. The insurance uses predefined drought conditions to trigger automatic payments for pastoralists at risk, preventing negative coping strategies that often compromise pastoralists and herds. Rather than replacing an animal after it dies, payouts allow pastoralists to buy water and fodder to keep their herds healthy even in times of weather-related shocks and stresses.